Distributed computing has been transformed with the introduction of virtualization technology. This has driven a re-architecture of traditional data center workload placement. In 2012, IBM® announced IBM PureSystems™, a new offering based on preconfigured software, servers, and storage that form an expert integrated system. 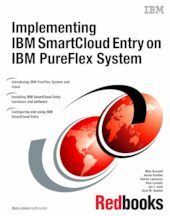 This IBM Redbooks® publication can help you install, tailor, and configure IBM SmartCloud® Entry on the IBM PureFlex™ System offering. This book is intended for anyone who wants to learn more about cloud computing with IBM SmartCloud Entry and offerings based on IBM Flex System™ elements.